Role play is something children do naturally, in play. They “pretend” to be firemen, school teachers super heroes and parents, interacting with each other and taking on different roles as they want. Dress-ups and props might become part of such play, but are not vital to it. In an educational situation, however, we want to nudge children into really thinking about what is going on in a book, or perhaps a character’s mind. I love that being involved in literature and other media helps kids “walk a mile in someone else’s shoes”. By encouraging our kids to really think about characters, their feelings and motivations, they are exposed to other viewpoints, and have the chance to develop concepts like tolerance and empathy. This is one of the many reasons I love picture books - they don’t take long to read, and then you can go on and engage children in activities that further their enjoyment in, and learning about, the book. One of these activities is role play. Sometimes we want to help children develop empathy by taking on the role of somebody else. It might be that we want our kids to put themselves in Little Red Riding Hood’s position, to imagine her worry over Grandma, and fear of the Wolf. Or we might want kids to understand what it’s like to be a hungry wolf, forced to play pretend just to get a meal. After we’ve shared a story with them, we can use questions like “I wonder what made the Wolf dress up as Grandma?” “If you were Red, would you want to take goodies to Grandma?” We can try re-telling the story, acting out all or some of it. By taking on the role of Red Riding Hood, of Grandma, Mother, the Wolf or the Woodsman, children are opening themselves up to different perspectives, and moving away from an exclusively egocentric viewpoint. Improvising action and dialogue, based on what they know of the story, means they think about and hopefully understand a story better, too. In an educational setting, especially as children get older, taking on a role is not as natural a part of everyday life. Many kids just want to be invisible, not take the risk of being looked at, or worst still, laughed at. This can be where whole group theatre games are useful. If everyone is taking on a role, no one is standing in front of the group. As students become more at ease with taking on a role, it becomes much less scary, and they relax enough to both enjoy themselves and learn. One easy way into role play is moving in certain ways e.g. “walk like a soldier”, “prowl like a tiger”. Before moving in role, I make sure my group has come to know the work space well first, by walking around it, noticing things, and moving on. Then I get them to keep walking, never touching anyone else, changing direction, and changing gait. Next I ask them to walk as different characters. and if they make eye contact with anyone else, they can stop and talk as that character too. A twist on this activity is to bring in a whole range of hats, have kids choose one, then go on and think themselves into the role suggested by that hat. Here’s another example of role play. Below is a video of some students playing the theatre game, Character Bus. They adopt the role of an over-the-top character, and get on a bus, where the other passengers immediately adopt the same role. Until the next passenger boards the bus… What I love about this activity, apart from the evident energy, is that the teen students obviously feel safe enough to take the risk of making a fool of themselves. There is no need for “real” acting. The whole idea is to exaggerate the characters, making it something easy to achieve. 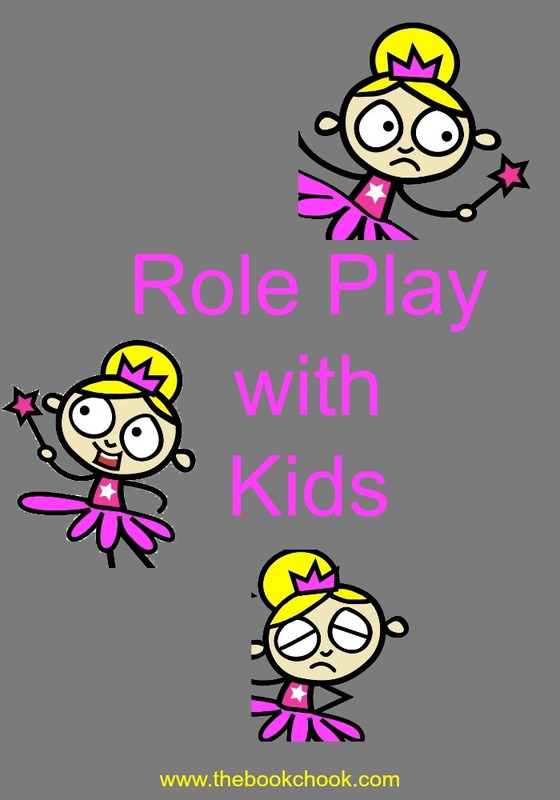 This is an entry level activity for role play with older kids, and one that helps them become at ease with adopting a role. Hot Seat is another drama activity that helps kids think their way into a role. Generally there is one student on a chair, in the middle of a circle of students, also seated. The one on the single “hot seat” has thought of a character he/she would like to be. The kids in the circle ask questions of the character, and the character improvises answers to their questions, talking and reacting the way the character would. This really helps students to delve further into what makes a character tick, and opens up their minds to different ways of looking at the world. Whether you’re a parent, a teacher, or a librarian, role play can help your kids get more out of books. Why not give it a try? You might also like to read Develop Imagination Through Literature-based Play, DRAMA 1, DRAMA 2, and Reader’s Theatre 1 - 4.